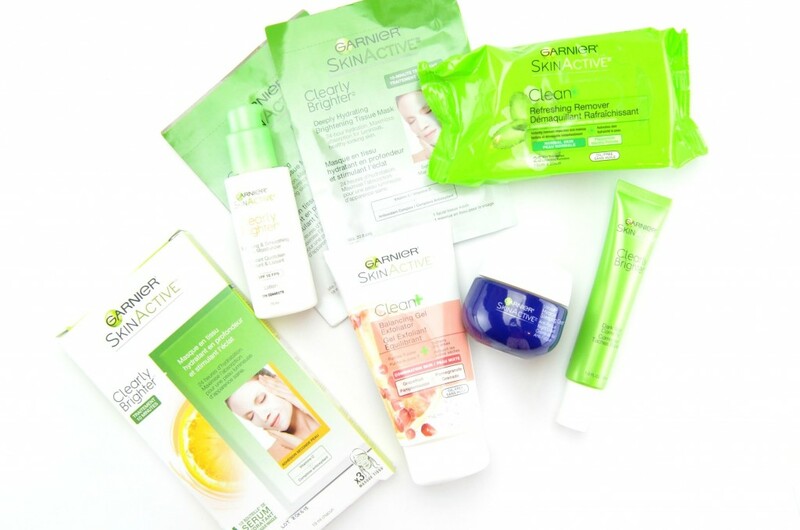 If you follow me on social media, you would have seen I attended a Garnier skin active retreat a few weeks ago. It was held at the beautiful Langdon Hall Country House Hotel & Spa in Cambridge. Everything about the weekend was absolutely perfect, from the personal in-room facial, to the incredible meals, the stunning room, morning yoga session, afternoon hike and pool session, to the personalized one-on-one skin consultation with Dr. Noah Wieder. Dr. Wieder asked me a series of skin-related questions to best understand my skin and my main concerns, so he was easily able to prescribe my own personal skincare routine. It’s not every day that I get my skin analyzed, so you best believe I took full advantage of this amazing opportunity. My main concerns were dryness, uneven skin tone with hyperpigmentation and the occasional blemish and breakout. 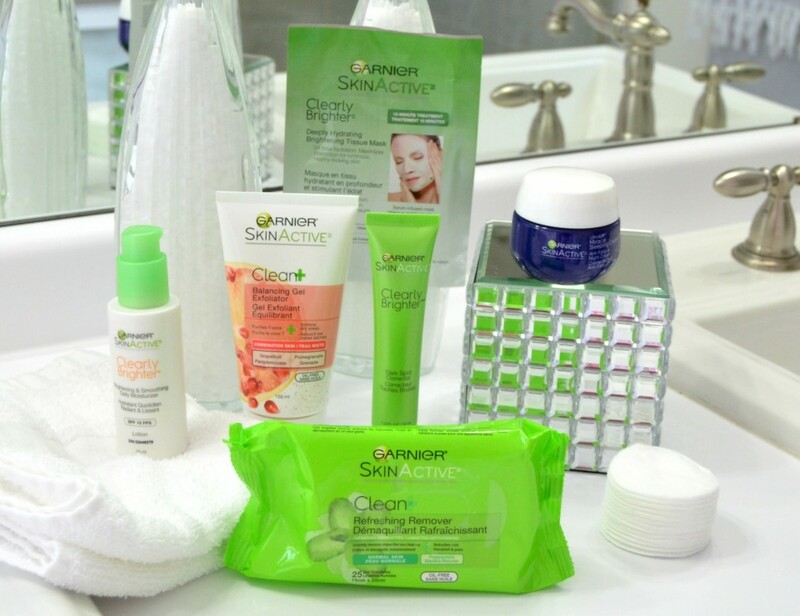 I was sent home with a 7-piece skin care routine, which included the Garnier SkinActive Clean Refreshing Remover to help remove most of my makeup, before heading onto the Garnier Clean+ Balancing Gel Exfoliator as my daily cleanser. 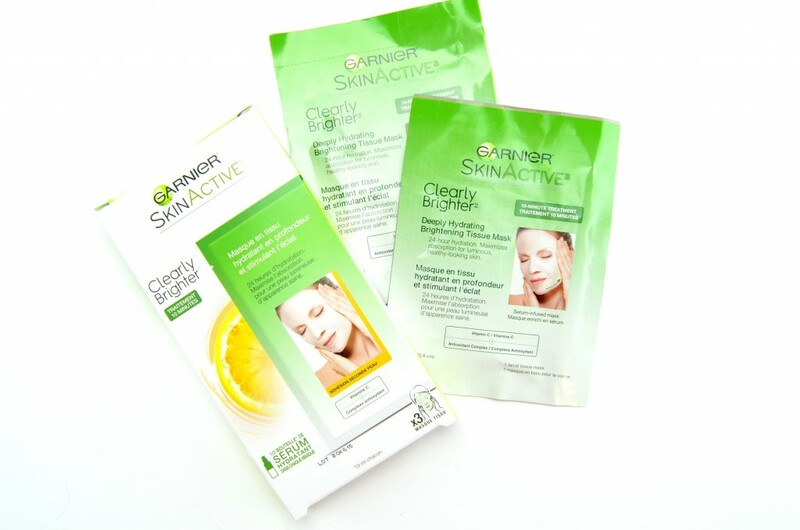 On days when my skin is feeling very dry, I can apply the Garnier SkinActive Clearly Brighter Facial Mask, followed by the Garnier SkinActive Clearly Brighter Dark Spot Corrector as my daily skin treatment. As far as my moisturizers, I was given the Garnier SkinActive Clearly Brighter Brightening & Smoothing Day Moisturizer for daytime and Garnier SkinActive Ultra-Lift Miracle Sleeping Cream for the evening. 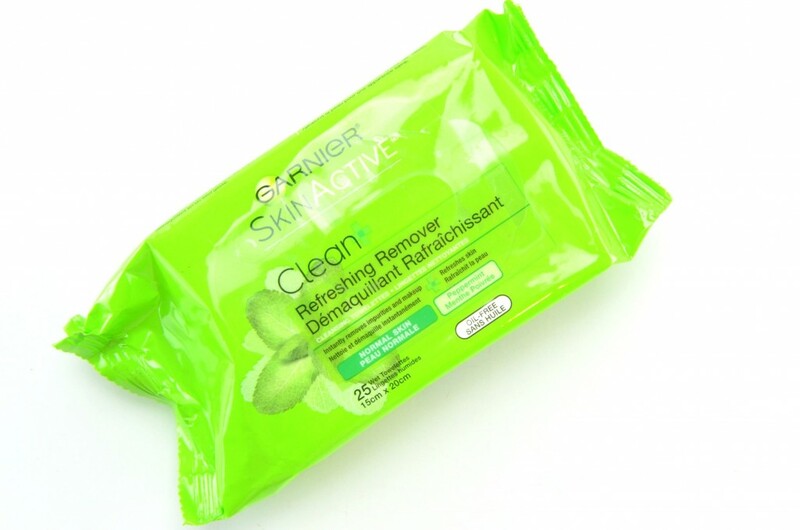 Garnier SkinActive Clean Refreshing Remover Cleansing Towellettes are a peppermint infused, oil-free, pre-moisten makeup remover wipe that’s my first step in my nightly skincare routine. It’s incredibly soft wipe instantly wipes away all dirt, oil and makeup for a fresh, clean face, even before my cleanser. It has a sturdy and strong enough fabric that allows me to fully cleanse my skin without the fear of it falling apart, and it’s also moist enough to thoroughly cleanse without having to add water. Each cloth is fairly large, allowing me to remove most of my makeup with a single towellette. It does a fairly decent job at removing most of my makeup, although I would never totally rely on a wipe alone to cleanse my skin. It doesn’t sting or irritate my eyes, like other wipes, which is a huge plus for me. I find the subtle peppermint scent quite relaxing, soothing and calming. It helps to leave my skin feeling toned, soft, smooth, moisturized and squeaky clean. 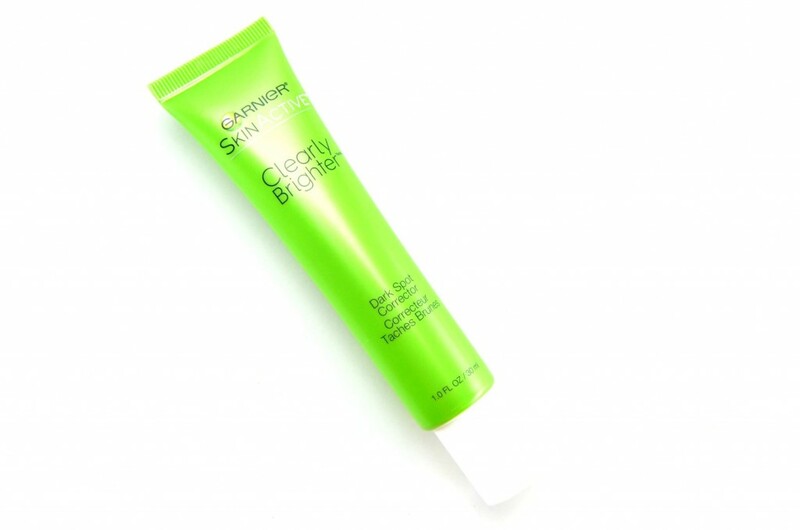 I’ve actually used Garnier Clean+ Balancing Gel Exfoliator in the past, and love it. It’s a deep cleanser formulated with grapefruit and pomegranate to help soften dry areas, balance the skin and cleans away all dirt, oil and impurities. It has a pinkish gel-like texture with tiny clear micro exfoliating beads that gently, yet thoroughly sloth away all dead skin cells. As it starts to slowly foam up, it creates a rich, creamy lather that instantly scrubs off all daily grime. I continue to scrub for a solid 2 to 3 minutes, allowing it to really get down into the skin for a deep clean, before rinsing thoroughly. It not only does an amazing job at cleaning my skin, but it keeps my skin extremely moisturized, unlike other scrubs I’ve tried in the past, that seem to strip my skin of its natural oils. It has a fruity and refreshing scent that’s perfect for waking me up in the morning. If you’re normally scared of hard, abrasive scrubs, I highly suggest taking a closer look at the Garnier Clean+ Balancing Gel Exfoliator. The exfoliating beads are less intense than other scrubs, yet still does an amazing job at exfoliating the skin. It is gentle enough to use daily, does wonders at clearing up any dry patches you may be experiencing and leaves your skin feeling refreshed, cleansed, smooth and ready to take on the day. Since it features an oil-free formula, you never have to worry about it leaving your skin feeling oily, greasy or sticky, just perfectly soft and smooth. 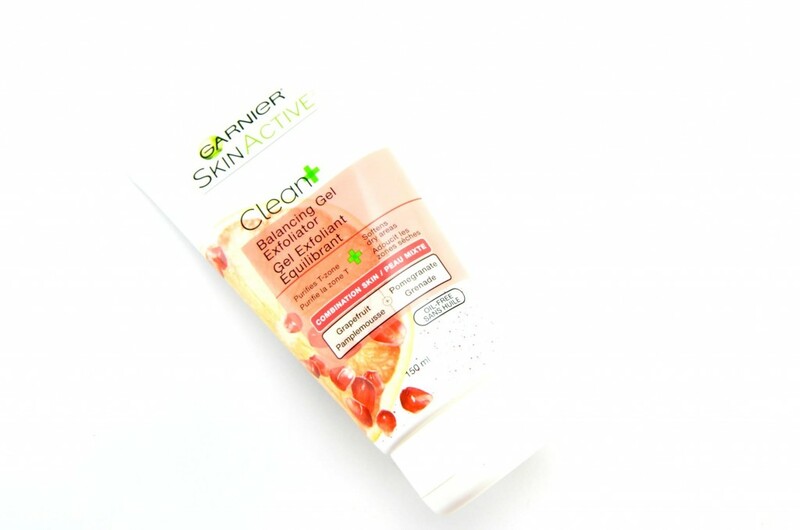 The Garnier SkinActive Clearly Brighter Deeply Hydrating Brightening Tissue Mask might be my favourite product out of my personalized skincare routine, as it helps to provide incredible moisture back into my dry, dull skin. 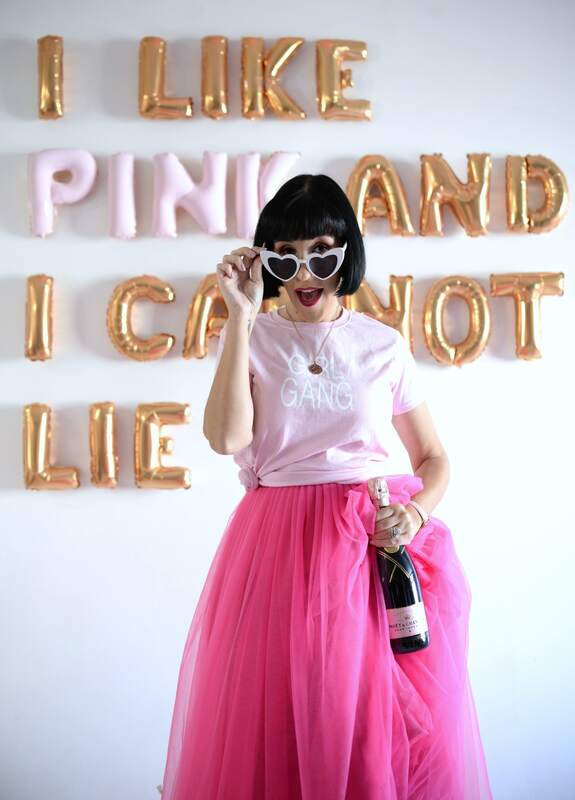 It’s actually infused with a half bottle of hydrating serum and vitamin C to help provide deep hydration and a luminous glow in 10 short minutes. It’s also created with a unique stretch-to-fit technology, meaning the translucent sheet mask fits perfectly to the natural contours of your face, ensuring the perfect fit, allowing for every single drop of the serum to go un-wasted. 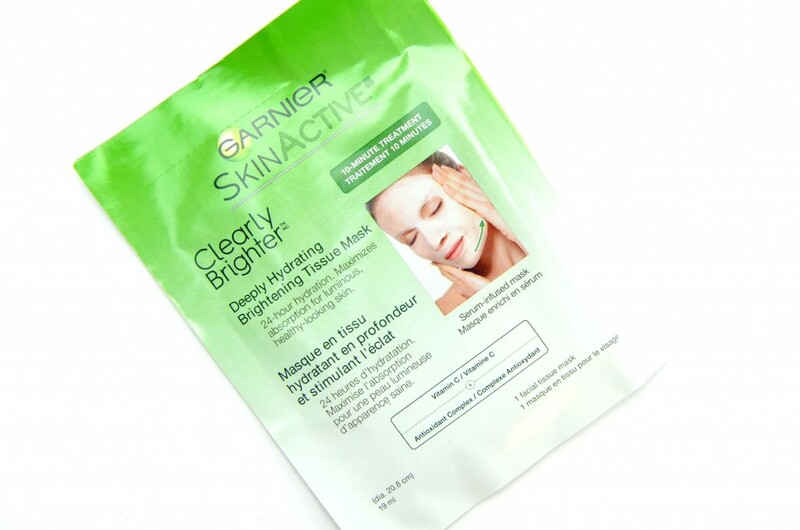 The estheticians used the Garnier SkinActive Clearly Brighter Deeply Hydrating Brightening Tissue Mask during my in-room facial and I could immediately see the results after a single use. Not only did it help to revitalise and brighten my skin, it left it extremely hydrated and moisturized. The vitamin C really does a wonderful job at brightening my dull complexion for a more radiant, brighter and luminous finish in a single use. My skin is left glowing, more even and over the past few weeks, it also helped to fade dark spots and hyperpigmentation. 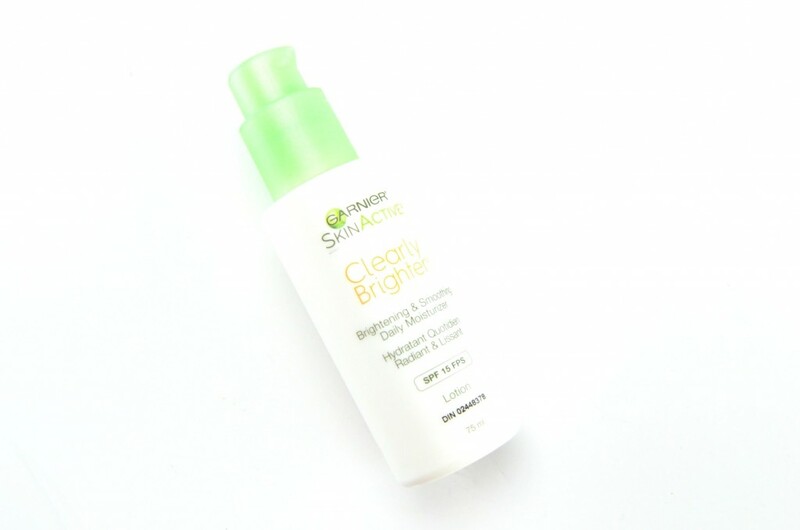 Garnier SkinActive Clearly Brighter Dark Spot Corrector is a daily treatment designed to help correct the look of skin imperfection, fine lines, dark spots, age spots and discolouration. It also helps to improve clarity for a more even complexion, while reducing the look of visible sun damage and re-surfacing the skin. It seems to have an effective amount of vitamin C and salicylic acid to help lighten dark spots and promote cell turnover for a more radiant younger looking appearance. Skin is naturally most active in the fight against dark spots overnight, usually between the hours of 11PM and 4AM, which is why I’ve been applying the Garnier SkinActive Clearly Brighter Dark Spot Corrector in the evening. It has a thin lotion texture and also it sets and applies fairly easily, as I continue to rub it into my skin, it tends to ball up and roll all over my face. Not only is it hard for me to target the areas where I have issues, truthfully, I don’t believe these dark spot correctors really do everything they claim? That being said, I think when combined with other skin brightening treatments, paired with my monthly chemical peels, it will help to visibly reduce dark spots overtime? A daily moisturizer with SPF, yes please. Not only is the Garnier SkinActive Clearly Brighter Brightening & Smoothing Day Moisturizer designed to help create a visibly brighter, polished looking complexion in as little as a single week, it’s formulated with SPF15 to help protect your skin from harmful UV rays. It’s formulated with skin conditioning antioxidant complex, paired with vitamin C and E to not only keep skin hydrated throughout the entire day, but will help to create a more radiant, brighter, glowing complexion. It also contains LHA to gently exfoliate the skin and sloth off dead skin cells for a smoother, even, refine texture. Garnier SkinActive Clearly Brighter Brightening & Smoothing Day Moisturizer comes in an easy to use, pump style bottle with an incredibly silky, smooth, gel-like texture. One pump is often enough to moisturize both my face and neck and its oil-free, non-greasy formula is rich and creamy enough to provide me with excellent hydration, yet is light enough to wear under my foundation. I love that it has SPF, for those days when I forget to wear my sunscreen, yet isn’t too thick, white or heavy to wear under my makeup. It blends into the skin beautifully, with absolutely no white overcast like other SPF moisturizers I’ve tried in the past. It does an amazing job at keep my skin moisturized the entire day without breaking me out. It doesn’t clog my pores, like most SPF formulas, nor does it have that strong sunscreen scent. 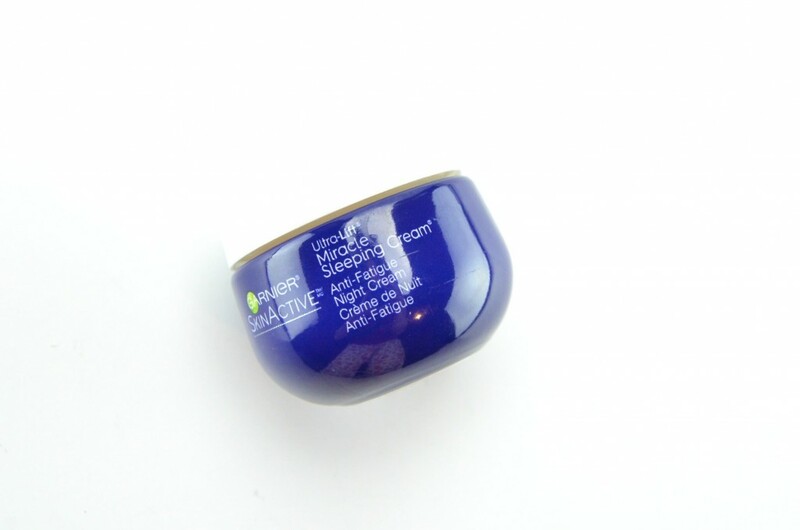 Last, but not least, the new Garnier SkinActive Ultra-Lift Miracle Sleeping Cream. It’s the best of both worlds, the hydrating and recharging benefits of a mask, with the light and refreshing feel of a cream. It’s applied in the evening, when your skin naturally regenerates cells, and it helps to reduce the signs of dull, dry, tired skin by morning. It’s infused with lavender essential oil, rare plant extracts, adenosine, hyaluronic and beta hydroxy acids that all help to exfoliate, repair skin’s moisture barrier and reduce the look of fine lines and wrinkles while you sleep. Garnier SkinActive Ultra-Lift Miracle Sleeping Cream comes in a large tub with a pinky, thin, creamy, almost gel-like texture that applies beautifully and evenly into the skin. It absorbs within a few short seconds without a greasy or sticky residue left behind. It gives an incredibly velvety, softness to my skin without clogging my pores or causing breakouts. It gives a slight cooling sensation that I find quite calming and soothing after a long, busy and stressful day. Although it can be applied as a nightly moisturizer by applying a thin layer of cream and massaging into the skin, I actually prefer it as a deep sleeping mask. I apply a thick layer of the cream to both my face and neck and let the aqua gel-like texture sink into my skin for a solid 15 minutes before gently massaging the excess cream into my skin before heading to bed. In the morning my skin is visibly plumper, more rested, fresher, radiant and ready to take on the world. It has a fresh, relaxing, spa-like aroma that quickly disappears after initial application, and all you’re left with is younger, lifter, firmer skin.